Mike Roberge fights off a defender for the ball. The senior forward and the Wildcats couldn’t find a goal in a 2-0 loss to UIC. 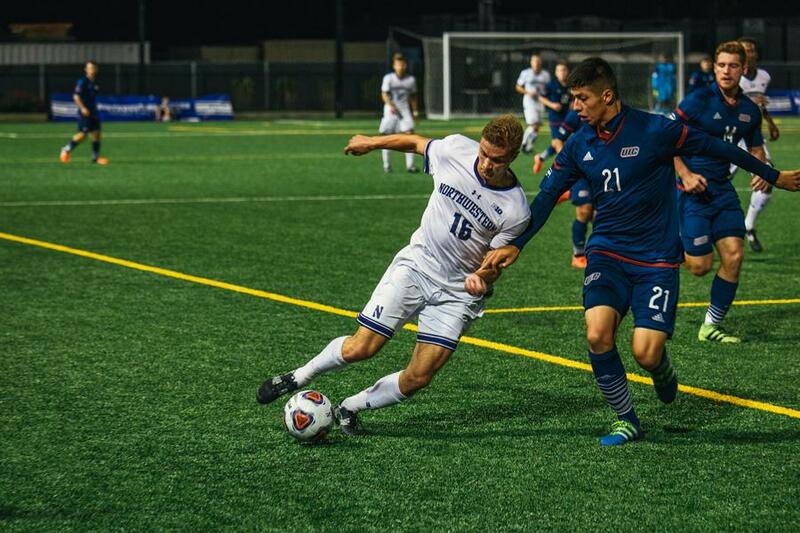 Northwestern is finding out how rare goals can be, as it failed to score for the third straight game in a 2-0 loss to crosstown rival UIC on Tuesday night at Martin Stadium. In the first half the Wildcats (2-9-1, 1-3-1 Big Ten) struggled to possess the ball against the Flames (5-5-3), an issue that has plagued them lately. As a result, NU was unable to sustain pressure on its offensive third of the field and failed to put a shot on goal before halftime. “I thought we came out a little flat,” senior forward Mike Roberge said. Coach Tim Lenahan said that although the Cats planned to sit back, they didn’t do a good enough job of pressuring UIC, which allowed the Flames to create dangerous offensive chances in the first half. Redshirt freshman goalkeeper Braden Thuraisingham, who made his first career start due to junior Francisco Tomasino’s suspension, was tested early and often. The Flames took 13 shots in the first half, and their sustained pressure paid off in the 26th minute when midfielder Oscar Rivero headed forward Max Todd’s corner kick into the back of the net. The Cats started the second half well, putting furious pressure on the Flames and creating several prime offensive chances. Early in the half, junior forward Elo Ozumba got behind UIC’s defensive line and received a through ball, but goalkeeper Andrew Putna tackled Ozumba and knocked the ball wide. The sequence drew frustration from the Cats, who felt they deserved a penalty kick. “I thought we had one with Elo,” Lenahan said. NU returned to the attack several minutes later, this time with Roberge leading the charge. The senior forward got the ball on the left side of the field and used his speed to beat a UIC defender around the edge into the box. Roberge unleashed a low-driving shot to the near post, but Putna denied his shot with a great leg save. On the ensuing corner kick, Roberge sent a header wide left. The Cats outshot the Flames 12-5 in the second half, but were unable to capitalize on any of their chances. Although UIC saw less of the ball in the second half, it took good advantage of its chances. In the 62nd minute, Rivero received the ball just inside the left side of the box with his back to the net. The Flames’ sophomore laid the ball off to fellow midfielder Nestor Garcia, who uncorked a curling shot that found its way into the top right corner of the net, doubling UIC’s lead. “It was a tough (game),” Thuraisingham said. Lenahan, however, praised his goalkeeper and said he did well filling in for the suspended Tomasino. NU has a good chance to get back in the win column on Friday when it travels to Piscataway, New Jersey to face Rutgers, which is winless on the season. Lenahan is optimistic that the team can still have success this season. “We still have a lot to play for,” Lenahan said. “We could get a home game (in the Big Ten Tournament).